Is history repeating itself? UM professors tell where they were in 1968 and weigh in on the issue of a nation divided in 2018. It was a year unlike any other, one marked by tragedy and turmoil with one traumatic event following another. Civil rights leader Martin Luther King Jr. was cut down by an assassin’s bullet in Memphis, Tennessee, on April 4, igniting riots across the nation. Shortly after winning the California presidential primary, Senator Robert Kennedy was shot at the Ambassador Hotel in Los Angeles in the early morning hours of June 5. He would die a day later. President Lyndon B. Johnson declined to run for office again. Tens of thousands of Vietnam War protestors clashed with police on the streets of Chicago at the 1968 Democratic National Convention. And there were also protests in the streets of Paris, Prague, and Mexico City. Fifty years later—in the wake of a Florida man being arrested and charged for mailing pipe bombs to prominent Democrats, including Barack Obama, and a 46-year-old man accused of slaying 11 worshippers at a Pittsburgh synagogue—many Americans see 2018 as a repeat of 1968. But is history, indeed, repeating itself? 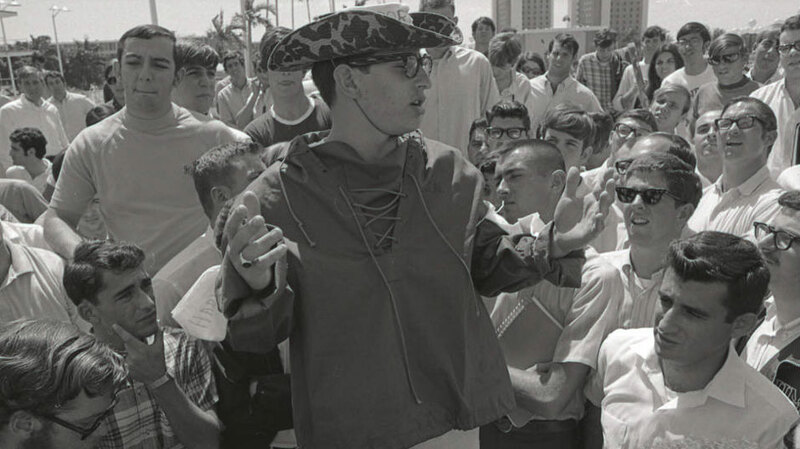 With voters preparing to cast their votes in the critical midterm elections on Tuesday, News@theU asked four University of Miami professors who were all college students in 1968 to give their perspective on the parallels between the two years and whether the nation is hopelessly polarized. Once suspended from tiny Edward Waters College in Jacksonville, Florida, for organizing and leading what school administrators deemed were too many protests that disrupted the campus, Marvin Dawkins knew in his heart that he was actually “doing the right thing”—that he was part of a legion of college students nationwide who were “only trying to raise the social consciousness of everyone,” he said. It was a decision that ensured his passion for activism would live on. Even as a student at a summer scholars program for minority students at Columbia University in 1968, Dawkins kept that passion ignited, attending Black Panther rallies and marching through the streets of Harlem. School of Law Professor David Abraham was an undergraduate at the University of Chicago in 1968, living and studying in the middle of the Windy City’s so-called Black Belt. Abraham remembers it all: armed sharpshooters on the roof of his apartment building during the civil disturbances that followed King’s assassination. Tear gas. Tanks on the streets of Chicago. During the ’60s, Professor of International Studies Bruce Bagley was at ground zero for the student protest movement of that time—first at the University of California, Berkeley, and then at UCLA, participating in demonstrations on both campuses. He joined the Peace Corps in 1968, spending nearly three years in Colombia. Distinguished Professor of History Donald Spivey, who teaches a course on the ’60s, was a running back on the University of Illinois football team in 1968, and as a student “we were in midst of all kinds of struggles, as everyone else across the country was,” he recalled.